Although potassium iodide tablets are available, infants and children may be unable to swallow the tablet, requiring parents to create a liquid solution by dissolving the tablets in water and mixing with juice or soda to mask the taste. For children who are able to swallow tablets, the KI tablets still have to be cut to achieve the proper dose for their age and weight. 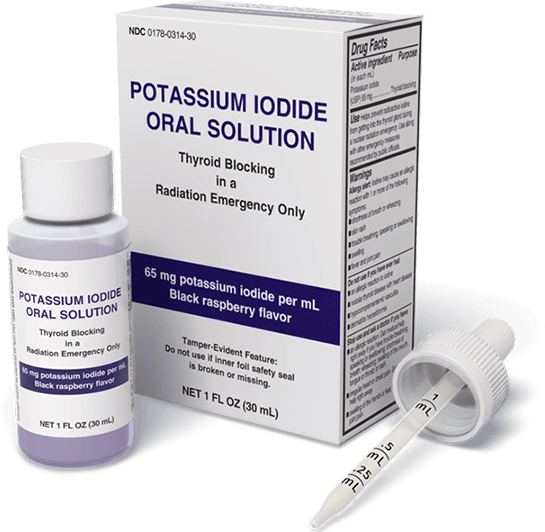 Ready-to-use Liquid KI Oral Solution provides a simple way to immediately and precisely dose potassium iodide when advised due to a nuclear emergency according to the FDA-approved dosing. Reference: 1. US Food and Drug Administration. Frequently asked questions on potassium iodide (KI). http://www.fda.gov/Drugs/EmergencyPreparedness/BioterrorismandDrugPreparedness/ucm072265.htm. Updated October 27, 2014. Accessed January 27, 2016.